It is most popular in Philippines. Topics: Cnc Community, C&c Galaxy, Cnc Guild, and Cncnz. Age: It went live on August 13th 2000, making it over 17 years, 7 months old. 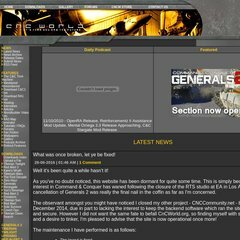 cncworld.org CnCWorld | Command & Conquer, Tiberian Twilight, Red Alert 3, The .. The estimated 351 daily visitors, each view 2.20 pages on average. It is hosted by Singlehop Inc (Illinois, Chicago,) using cloudflare-nginx web server. ns2.valcato.com, ns3.valcato.com, and ns1.valcato.com are its DNS Nameservers. The site is programmed for PHP/5.4.11. PING (184.154.24.162) 56(84) bytes of data.